Today my words came back to me. My beloved Steve was comforting with his encouragement that there can be many setbacks even when on the road to recovery. Ah yes. The old, “recovery is a jagged line” speech. 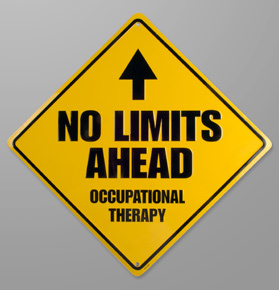 I have let those words fly many times when working with my patients as an occupational therapist. There was the cardiac patient who was frustrated with having to restrict his activity level to basically mope-ing around the house for his first week home from the hospital. I also recall a lady practically quarantined in a back bedroom of her home with a great view of the surrounding woodlands. She had a portable refrigerator, phone, laptop, accessible bathroom, hospital bed, wheelchair, walker and many conveniences to help her recover from a knee replacement surgery. I had to encourage her to push up her jagged line a bit lest she become too comfortable in her hospital room at home! One of the many reasons I enjoyed working in home health care was the ability to use the person’s real-life situations, supplies, and responsibilities as part of his or her occupational therapy. The role of an O.T. is to evaluate the daily activities of an individual and the skills needed to complete those activities. When there is a breakdown due to an illness, surgery, mental health problem, developmental delay, disability, or disease process, the O.T. works with the patient and his or her resources to restore function. I was always amazed at how “resourceful” some patients could be! I think the farmers were the best. I’ll never forget the industrious wife of a patient suffering after several failed back surgeries. The lady of the house had built from scrap wood a rolling cart with a seat on top and rope attached to move it along the floors in her home. What was she moving? Well her husband of course! He was eligible for a wheelchair rental but evidently the subject never came up. I don’t think they even wanted one when it became available. The downside: the gentleman would not likely become independent in household mobility and related activities when sitting on a cart that had to be pulled by others. Recovery is sometimes a flat line too: no true recovery at all. As for me, the recovery is moving forward. I am 12 days into using high CBD hemp oil to attempt to control daily seizure-like tic episodes. Today I had a setback for about 2 hours but at least the episode was low grade without a severe neck headache or pain. And when night time rolled around to my bewitching hours of 9-11:00 p.m. there were pre-tic symptoms and nothing else. This is the second night in a row with relief! Every night prior to this and for the past 8 months I have had 2-4 hours of intermittent seizures. Virtually every day or night for the past 2-1/2 years I have had intermittent waking seizures. Praise the Lord, the pattern is changing! At either set intervals or when noxious symptoms start I take a full or partial dose of high CBD hemp oil and get relief. Nothing has ever done this before! If you are curious about high CBD hemp oil then I offer this informational website: www.mycbdresearch.com and join the discussion on Facebook at: www.facebook.com/CBDhempandseizures There’s hope here for many with seizures and other neurological, intractable health conditions. For all of us there is one ultimate source of hope that will sustain us whether recovery is a straight, jagged, or invisible line: a relationship with the Lord, Jesus Christ. To find Him we only need to get on our knees and open our hearts to His enduring love, His love letters to each of us in the Bible. I would have never made it this far without my Jesus. I am humbled and grateful for many aspects of these past 2 1/2 years: I’m working on accepting the wretched parts.